Sleeps two, one queen bed and one bath. The living room is loft like, a sun filled, well appointed open living room with wall of windows. In the summer keep it wide open to live out doors and in the winter it’s very cozy, central heating plus wood-stove (wood provided). Brand new kitchen, dishwasher, coffee maker and microwave, all stocked with the basics. Spa-like bathroom also with a lovely deep tub and a skylight. Sunny double bedroom. Spacious dining area seats 6. Flat screen TV & new DVD player & iPod dock. AC window unit, also mini library filled with books and magazines. And a brand-new washer & dryer available with the rental of both houses. You also have your own little blue-stone patio to relax on overlooking the pool with Acorn Hill behind. Both houses are provided with Hairdryers, and ‘Bearsville Retreat Soaps’, which are delicious, vegan, non gmo, cruelty free and made with love in the USA. Plus shampoo & conditioner, fresh new linens & towels in both houses. The property is all on one-level with only a few steps, so folks with limited mobility could navigate the property. Well-behaved pets considered. We are a strictly non smoking property through out the compound. Sleeps four (two bedrooms, one king & one queen one bath.) The bedrooms are off two sides of the living room and are private to each other. The living room is well appointed, with a woodsy open plan feel, centered around a brick face fireplace. There is with a flat screen TV, DVD player, Wi-Fi & iPod dock. The brand new kitchen, has a dishwasher, microwave, blender, coffee maker and is stocked with all the basics. The bathroom is spa-like with a lovely deep tub and a skylight, to relax in while gazing at the stars. A favorite room is the dining room which seats 6, like an old fashioned Captain’s cabin, wood-lined and super cozy for the best dinner parties, it’s a room for passing the port and telling tall tales. Off the living room there is a sun room to relax in which leads outside onto a suntrap patio with a dining table for alfresco dining. In the front of the house there is a bluestone patio for drinks while watching the sun go down over Mount Tremper. The Retreat is a great place to stay for the Woodstock Writers’ festival, and the low key yet glammy Woodstock Film Festival and year round for the famous Bearsville Theater for musical events. We are in a triangle of three great ski resorts, Hunter Mountain, Windham and Belleayre. Also 5 minutes away is Kenneth Wilson Campground which has a lake offering canoe and kayak rentals and a nature trail. Also Horse lovers, please take note, convenient to the H.I.T.S for summertime equestrian events. The Hudson River nearby offers (boating/kayaking/swimming/historic house tours/boat tours) and The Culinary Institute of America, Bard College/The Fisher Center/Opus 40/ WAAM museum in the village/ and many fine museums and galleries are near by for your cultural needs. Or just stay home and relax in the hammock! Hiking, biking and swimming are just outside your door. We will provide you locations and activities info. Hike to the top of Overlook Mountain and visit the ruin of the grand hotel where General Grant once stayed. Local swimming holes a short drive away. For kids a visit to the Woodstock Animal Sanctuary is great to go visit or volunteer for a couple of hours and meet the animals in the hamlet of Willow. There are 2 bikes available for your use, and additional bike rentals are available in the village. There are are two yoga mats and blocks provided and there are yoga and pilates classes in town. We also provide books, board games and cards in both houses with a croquette set and badminton for the lawn for the moreenergetic! Also you can cruise on the Hudson river from Saugerties to see the historic houses and ruins. Go to a concert at the Maverick concert Hall in Woodstock. Or visit the relaxed Woodstock Film Festival and the Woodstock writers festival. Or walk Opus 40 or Storm King. The local spa is less than a mile away also nearby there is the well reviewed Emerson Spa offering massage and other spa treatments. Woodstock Art College offers arts and crafts classes and workshops. There are also local wineries and vintage shopping in Saugerties. Rock climbing nearby in Minewaska State Park. Omega Institute offers classes, two Buddhist monasteries are close by and offer day meditation visits. The heated, saline pool is open for the summer season mid May to mid September and the coolest part is it that it has an underwater light for midnight swims. The hot tub is open all year. Or just read a book in the hammock. Zagat rated local restaurants in the village: ‘Cucina’, ‘The Red Onion’, ‘The Bear Café’, ‘Oriole 9’. There are also excellent vegan/veggie options, at ‘Yum Yum’ or ‘Garden Café’, or stay home and dine on the patio under the stars. We provide a charcoal barbecue. There are walkable local restaurants, the Bear Café, Little Bear (Chinese option) and the local ‘Cub Market’ for deli counter and home made sandwiches, or bike ride to ‘Sunfrost’ with their amazing juice bar and delicious soups and wraps and salads where you can sit outside – they also have a huge selection of their own organically grown produce, or go into the village for the renown ‘Bread Alone’ bakery simple and absolutely delicious. If you want to go a little further afield the 214 Restaurant (5 stars!) in Phonecia after skiing and Sweet Sue’s just down the road in Phoenicia for an amazing brunch! Peekamoose in Big Indian is run by former Danny Meyer/Gramercy Tavern chef if you want some serious eating and they have a cool bar to relax in with marshmallows provided around the campfire out back. Or head over to Rhinebeck to terrapin for foodie feasting. The best part of the retreat for food is our wonderful neighbors at Reynolds Farm. They have a little stand where they sell fresh, truly happy, free range eggs, their own honey, and maple syrup tapped from Acorn Hill behind us and refined by hand next door! When in season they also offer organic garlic and blueberries. 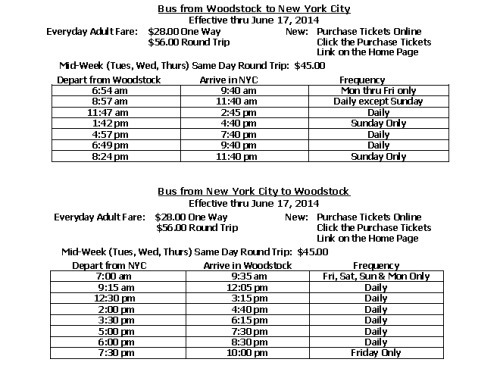 Travel: Driving from New York City is approx 2.15 hours, or if you prefer to be car free you can travel by bus from New York City or Albany, the bus will drop you right in Bearsville It is a 5 min walk to the property, or you can call Woodstock taxi service if you prefer. Alternatively take the train via Amtrak to Rhinecliff and then taxi (approx. 30 min). There is easy access to the property in winter, the drive will be plowed for you if there is a snow fall. The nearest public airport is Albany and for private planes (Stewart) Newburgh. Adirondack Trailways 1800 776 7548 add 5minutes to the schedule for Bearsville times.